Wedding centerpieces are a super-important focal point for your reception space. Before you meet with your florist, It’s important to envision the types of arrangements you want. You might be surprised that there’s more to the process than simply choosing your favorite flowers. 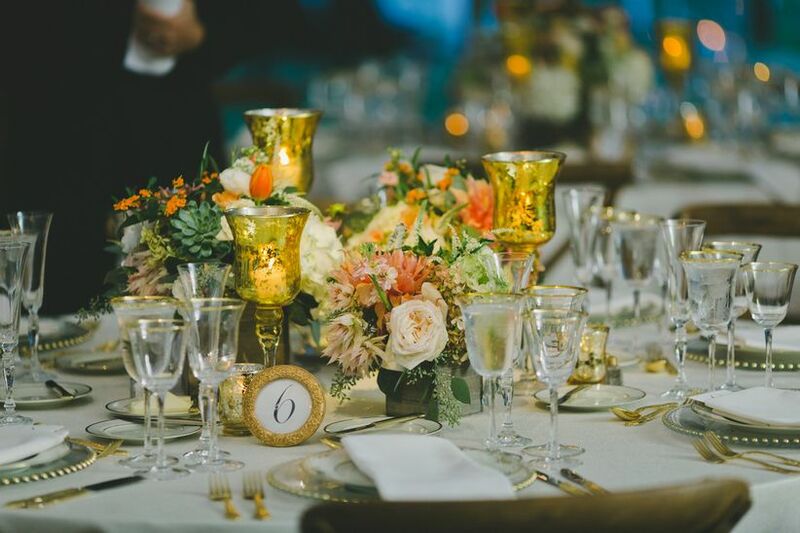 To get you started, we’ve broken down the main things you should consider when deciding on your wedding centerpieces. How many wedding centerpieces should I order? The number of centerpieces you’ll need is based on the number of tables you’ll have at your reception. 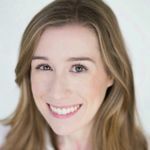 Give your florist an approximate guest count as soon as possible, even if you don’t have the exact number finalized just yet. You will also want to consider additional arrangements for the head table, sweetheart table, welcome table, dessert table, etc. You guessed it—the more centerpieces you need, the more money you should plan to spend. The price will also be higher for out-of-season flowers and rare blooms that have to be shipped in from far away. 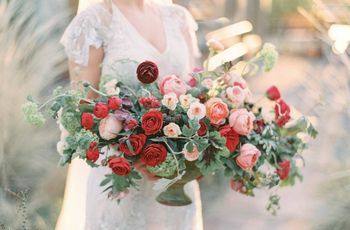 Be honest with your wedding florist about your budget and work with them to choose flowers that you can comfortably afford. On average, about eight percent of your total budget should be allotted for flowers. If you need a lot of centerpieces, consider using lower-priced flowers with minimal accents to keep the cost under control. On the other hand, if you’re having a smaller wedding and only need a handful of centerpieces, you might be able to splurge a little more for each one. Lastly, think about repurposing flowers from your ceremony, such as using aisle markers or bridesmaids’ bouquets in place of actual arrangements. Your centerpieces should complement the hues in your wedding color scheme. If you want the flowers to match the rest of your decor perfectly, be as specific as possible with your florist. Bring fabric or paint samples of the exact colors you like, and also describe any table linens, china, glassware, and chair sashes you’re using. While some flowers might not be an identical match, your florist should be able to get pretty close depending on your budget and wedding season. For spring and summer, neutrals, bright colors and pastel hues are always popular options. 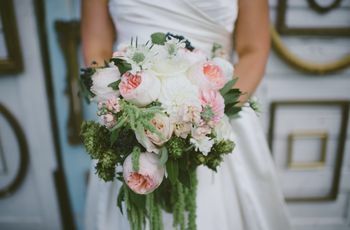 Some of the most requested wedding flowers for this time of year are peonies, anemones, tulips, poppies, ranunculuses, hydrangeas, garden roses, and sweet peas. Flowers with darker jewel-toned colors, such as dahlias and mums, are common during the fall and winter. For the most part, you’ll want to choose flowers that fit into your wedding season. While there’s no right or wrong when it comes to this (it’s your wedding, after all! ), there are some flowers that naturally make sense for specific times of the year. For example, poinsettia and evergreen centerpieces look beautiful for winter holiday weddings, but they might seem a little out of place at a midsummer soiree. It’s also important to remember that not all flowers are easily available year-round. If you want a specific flower that’s out of season, work with your florist to find a similar option (or be prepared to spend more money to get exactly what you want). Blooms that are available year-round include roses, hydrangeas, orchids, lilies, and greenery, which looks beautiful with or without flowers. 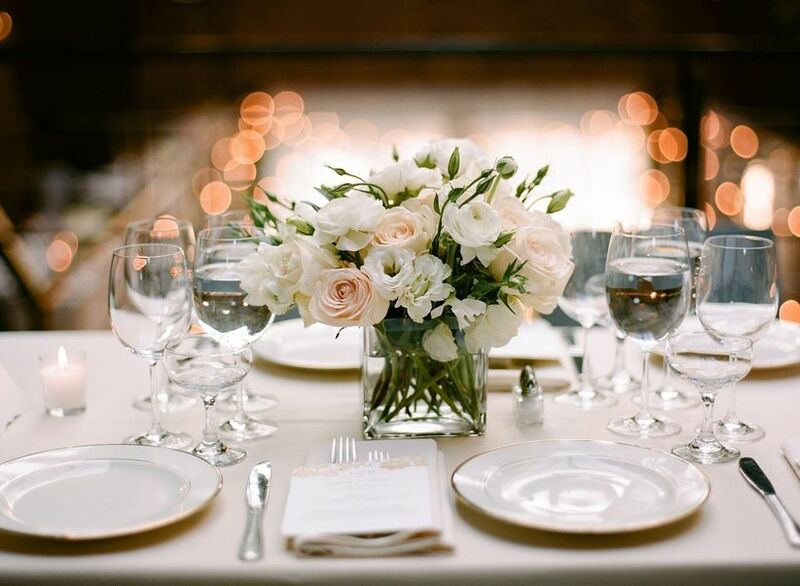 If you’re trying to decide how your centerpieces should look, think about the basic elements of your wedding. What is your venue like? If your reception is taking place in a stately, historic ballroom, classic arrangements that are somewhat formal would probably work best. For a barn or outdoor setting, you can try centerpieces that are a bit more relaxed and free-flowing. You’ll also want the centerpieces to match the rest of your reception decor so the space has a cohesive feel. 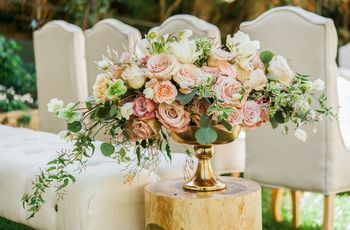 For a rustic wedding, it wouldn’t necessarily make sense to have centerpieces that are adorned with crystals or rhinestones if the rest of the decor is more country chic. When in doubt, ask your florist for their suggestions. Look at examples of their work from weddings that match your overall theme or venue type. Another detail you should think about is the height of your centerpieces. Tall arrangements bring a sense of glamour and drama to a reception space, but they can potentially obstruct your guests’ view from the table. Shorter centerpieces work well in cozy spaces, but it might require more flowers to make them stand out. If you can’t decide between tall or short centerpieces, don’t be afraid to mix the two. Many couples choose to have taller centerpieces on some tables and short centerpieces on the others. If you want to draw attention to the head table, decorate it with tall centerpieces and use short centerpieces for the guest tables. The containers that display your centerpieces are just as important as the actual flowers. From glass cylinder vases and silver flutes to small porcelain compotes, centerpiece vessels come in all different materials, shapes and sizes. Most florists should be able to provide the appropriate vessels for an additional cost, but you can also rent or purchase them on your own. Take your centerpiece arrangements to the next level by adding decorative accents, such as strands of pearls, crystals or playful feather plumes. 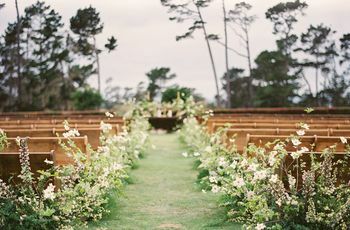 Incorporating lush greenery and foliage is another option that we love. Certain types of accents can also be used to achieve height if you want tall centerpieces without the accompanying price tag for the vessels. Adding a few curly willow or birch branches to each arrangement can easily create the illusion of taller centerpieces. Don't be afraid to get creative and step outside the box!